When it comes to being a Southern Illinois University Edwardsville Cougar, the Jambgas have made it a family business. This fall, SIUE welcomed Hadyn Jambga to campus, joining his older sister, Bailey, and brother, Devyn, to complete the sibling trifecta. This should come as no surprise since the children’s parents, Gwinyai and Stephanie (Montgomery) Jambga, are SIUE alums as well. Gwinyai served as a vital piece of the SIUE men’s soccer team in the early ‘90s, earning a bachelor’s in political science and French in 1993. Stephanie played a pivotal role in SIUE softball’s success of the late ‘80s, and achieved a bachelor’s in elementary education in 1991. “My experience at SIUE was excellent,” Gwinyai shared. “Academically, I felt challenged and well prepared for employment post-graduation. I made many lifelong friends – and most importantly, I met my wife. I was also very challenged and pleasantly surprised by the high level of talent that was assembled during my years under former SIUE men’s soccer head coach Ed Huneke and his staff. Upon college graduation, the Jambgas married and lived in Edwardsville for a few years. They then lived in St. Louis for seven years, where Gwinyai served as director of supported employment at the Judevine Center for Autism and Stephanie worked as an elementary and parent educator. By 2013, the entire family was involved with the Harare International School. The children were either students or graduates, Gwinyai was athletic director, and Stephanie was an elementary teacher, middle school girls’ basketball coach, and high school girls’ volleyball and soccer coach. Geographic distance is not enough to keep the parents from remaining heavily active in their children’s academic and athletic success. Gwinyai and Stephanie now live in Paraguay, and thanks to modern technology, the Jambgas are able to constantly communicate with one another via Facebook, Facetime, Skype and phone. 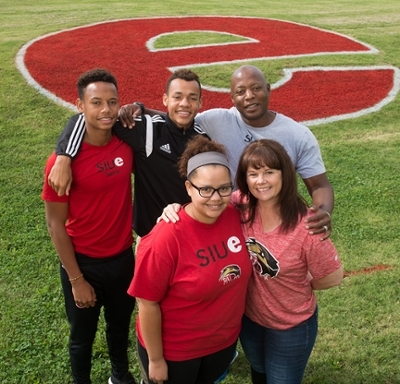 The parents have not missed an SIUE men’s soccer match since Devyn joined the team a few years ago, often waking up as early as 2 a.m. to view each game’s live stream. Gwinyai and Stephanie shared that there was no encouragement for their children to also attend SIUE. It was a choice for each child, and each decided to follow their siblings and return to their roots in Edwardsville. The choice not only brings ease to the parents’ travels and pride to the all-Cougar family, but also continues to cultivate an already strong sibling relationship. Gwinyai and Stephanie traveled to attend SIUE Homecoming 2016, visiting with old friends as they spectated live at Korte Stadium for the first time, their sons proudly wearing the colors of their alma mater. Photo: The Jambga family, (back L-R) Hadyn, Devyn, Gwinyai, (front L-R) Bailey and Stephanie, reunites during SIUE Homecoming.